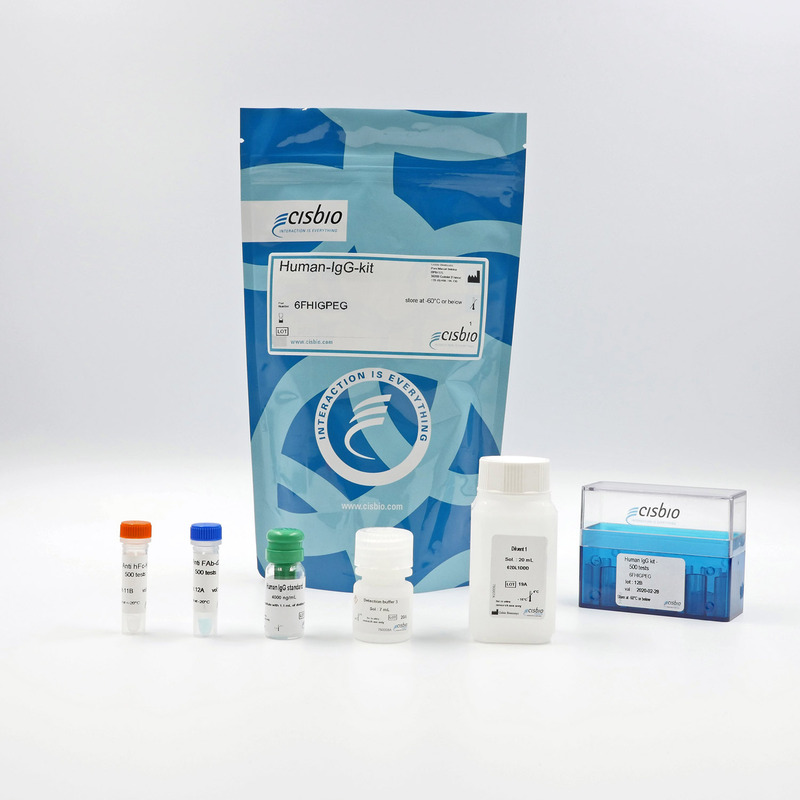 The Human IgG kit is designed for the fast quantification of human IgG. Drug discovery and bioprocess often require accurate quantification technologies to improve the productivity workflow. Current methods such as ELISA do not properly fit with such objectives as they require multiple sample-handling and protocol steps. The human IgG kit enables a rapid quantification of human IgG in cell supernatant and the selection of the best producer clones. The assay is compatible with natural IgG as well as recombinant antibodies. This kit is a sandwich immunoassay enabling highly sensitive quantification of human IgG, even when using a small sample volume. The assay uses two polyclonal antibodies, one (Fc specific) labelled with Cryptate and the second (FAb specific) with d2. The signal intensity is proportional to the number of antibody-antibody complexes formed and therefore to the human IgG concentration. The human IgG assay features a streamlined protocol with only 1 incubation step after sample and human IgG detection reagents dispensing. This protocol requires a single two-hour incubation period at RT. The figure below shows the human IgG kit calibration curve. The assay was performed in a 384-well small volume white microplate in a 20 µL total volume, using 10µL human IgG calibrator diluted in PBS 0.1 M and 5 µL of each conjugate. The two HTRF conjugates may be pre-mixed and added in a single dispensing step to further streamline the protocol. After 2h of incubation, the signal was read on a PHERAstarFS flash lamp.